The Livadi Beach is located south-east of the hora of Schinoussa. For the way to the beach you need about 30 minutes. On the way you pass over at several pastures with cows and goats. Even cows can not be seen so often on the Cyclades. The beach Livadi is quite nicely and provides a few shade trees. Taverns, we have not seen, but it will probably give one in the main season. On the way back you can alternatively go at the direction of the west coast. Here you will find mostly small rocky coves, not inviting for sunbathing. After 20 minutes you reach the Tsigkouri Beach, where you can stay or go up the hill to the chora. 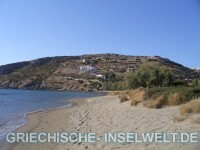 The Tsigouri Beach is located south of Schinoussa below the chora. For the way to the beach you need about 20 minutes, back a little more, because then you go up the hill. Tsigkouri is the main beach of the island, the sand quality is good, but the way into the water is onerous in some places. There are not so much trees, which spend shade. There are two taverns, which offer food and drinks. You should not miss the sunset, the sun goes down into the water.